Ismo Matinlauri - VP at Cargotec Corporation - shares his views on how companies should have a strategy-driven approach to M&A. Ismo has over 15 years of experience with M&A from strategy development and target screening up to integration planning and execution. Recently he has moved to project sales. 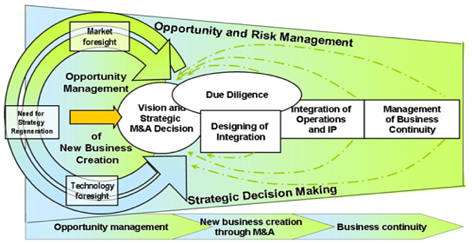 Source: M&A as a Strategic Option – from Opportunities to New Business Creation. Mélanie Hassett, Minna Räikkönen, Tuija Rantala, Teknova 2011. Regardless of the business category you fall under, it is important to take the time to build and understand the strategy behind M&A activities. It creates the basis for the M&A process and ultimately improves the success rate. What would be the high-level investment thesis / transaction rationale? Is the potential acquisition in line with corporate and business unit strategy? The first step in providing good results is to develop at least 10 key on/off-type criteria to evaluate the target companies based on the strategy. The key here is to only accept companies scoring a 9 or 10. Anything lower means you are not fulfilling all of the strategic goals you have set for yourself. Practice has shown that lower score acquisitions have a lower probability of success, given that they have failed to meet the targets set for the acquisition. Does it fit with the strategy, i.e. creates additional business value to justify the investment? Are risks identified adequately and on an acceptable level? Do we have sound integration plans and resources to execute them? The decision makers should review the summary report as part of the final decision making process. The summary will also be a working tool for the integration manager and team to address the issues identified and reported upwards during the integration period.